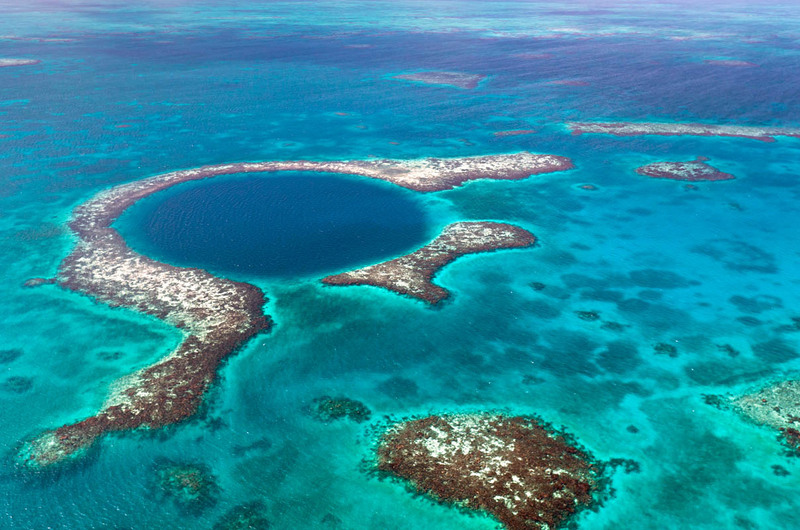 Been diving in Great Blue Hole? Please Vote! Diving at the Blue Hole was probably one of the most unique dives I have ever done. On arrival at the sinkhole, I was met with turquoise clear water that suddenly forms a perfect dark blue circle surrounded by a frame of reef with a break to allow the boats to enter. Aerial view of the Great Blue Hole, Belize. The dive briefing is pretty long with so many safety precautions being in place. I and my buddy entered the water and descended into the blue, there is no feeling of depth in the sinkhole, and without carefully watching the dive computer it is easy to see how many people have descended past safe limits. The rows of stalactites form at 40m an eerie unexpected site that we have far to little time to explore before having to ascend to our shallower level. In the centre of the abyss we start to see shadows of larger creatures, which gradually draw closer, these are grey reef sharks and massive groupers. As I watched the life go by I could see I was being watched too, by one of the groupers, which then started to follow me. At the time I thought it may have been my paranoia but the guide had also spotted it too. I was continuing the dive when suddenly it decided to try and take a nibble at my hair… I think it mistook this for bait as I did have in a ponytail at the time. This is one of the weirdest experiences I have had underwater and did cause a lot of amusement among the rest of the group. The Author: Debbie Woods is a PADI and SSI Master instructor with 6000 dives accross 4 continents. Map of Belize, Great Blue Hole dive site.